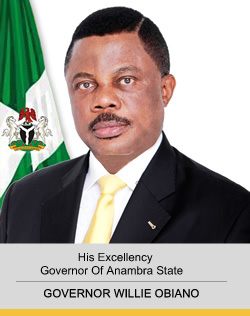 Information reaching our newsdesk, indicates that all is now set for the second term inauguration of Chief Willie Obiano and Dr Nkem Okeke, as Governor and Deputy Governor of Anambra State, today, Saturday, March 17, 2018, just as a three-day celebration has been declared, reports ITRealms. Disclosing this weekend, the Chairman of the Second Term Inauguration Committee, Hon. Ifeanyi Ibezi, said that a three-day programme of activities has been put together as the inauguration ceremonies. Also, a press statement sighted by ITRealms, quoted Ibezi as saying that the programmes of activities include a business roundtable with a theme “Consolidating the Vision”, which will take place in Awka, the state capital. This will be followed by the formal inauguration ceremony at Ekwueme Square, Awka, on Saturday, March 17, 2018. According to Ibezi, the concluding part of the inauguration ceremonies will be a thanksgiving Mass to be held at St. Patrick’s Catholic Cathedral, Awka on Sunday, March 18, 2018. The Chairman explained that the convocation of the Anambra Business Roundtable is to signpost the trajectory of Governor Obiano’s second term which is targeted at ushering in a “Greater Tomorrow” for Ndi Anambra. Ibezi stated that the business round table will bring together critical stakeholders from the public and private sectors to highlight growth opportunities in the emerging industries in the state, adding that at the end of the roundtable, new partnerships would be established aimed at making lives better for ndi Anambra, through sustainable value creation. He further disclosed that Mr. Edward Kallon, the United Nations Resident Coordinator, will be leading international development partners to this very important roundtable. On day two of the inauguration programme, Honourable Ibezi disclosed that Ndi Anambra would witness and participate in a swearing-in ceremony, the first of its kind not only in Anambra State, but also in the entire South East geo-political region. He pointed out that already all the various twenty-one local government areas in the state have been sensitized to participate in the ceremony adding that preparations at Ekwueme Square, venue of the swearing-in ceremony, were almost completed. Ibezi further disclosed that the swearing-in ceremony would be witnessed by dignitaries from across Nigeria and some selected foreign countries. According to him, invitations had been distributed since three weeks ago. ITRealms recalled that Governor Willie Obiano and his Deputy, Dr Nkem Okeke, recorded a landslide victory during the November 18, 2017, Governorship election, winning in all the twenty- one local government areas of the State. “That victory is not only the first of its kind in Anambra State, but also in any of the States of the federation,” he declared.